Shepard's United States Citations provides coverage of United States Supreme Court decisions. For pricing or to place an order, please contact us at 1-877-394-8826. Shepard's United States Citations provides coverage of United States Supreme Court decisions. You will retrieve U.S. Supreme Court, lower federal and state cases that have cited your Supreme Court decision, including histories (prior and subsequent) and analysis on unrelated decisions that may have affected the precedential value of your case (such as cases that criticize, distinguish or overrule your case). Shepard's analysis also includes true positive treatment, which indicates when your case has been expressly followed by another decision. • The 106-volume master edition of Shepard's United States Citations contains full citations coverage for researchers using any one of the major Supreme Court reports, i.e., U.S., L.Ed. and S.Ct., plus coverage of citations to the U.S. Code and to provisions of the U.S. Constitution. • The 36-volume master edition of Shepard's United States Citations contains full citations coverage for researchers using any one of the major Supreme Court reports, i.e., U.S., L.Ed. and S.Ct., but omits the statutory and constitutional coverage. • There are three 60-volume editions of Shepard's United States Citations, each of which contains citations for researchers using just one of the major Supreme Court reports (U.S., L.Ed. or S.Ct. ), plus coverage of citations to the U.S. Code and to provisions of the U.S. Constitution. • There are three 24-volume editions of Shepard's United States Citations, each of which contains citations for researchers using just one of the major Supreme Court reports (U.S., L.Ed. or S.Ct. ), but omits the statutory and constitutional coverage. 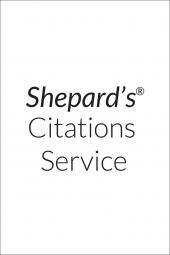 A cornerstone of the legal research process since 1873, Shepard's Citations saves you time and costly errors by helping you validate your research. Shepard's also helps you build your legal arguments by providing relevant cases and secondary sources that cite your authorities. Generations of lawyers have Shepardized their cases and statutes to ensure they have good law and to retrieve comprehensive lists of citing references. In addition to the bound volumes for your Shepard's United States Citations, you will also need the corresponding all-inclusive subscription to guarantee receipt of all cumulative supplementation and any bound volumes issued during your subscription year.